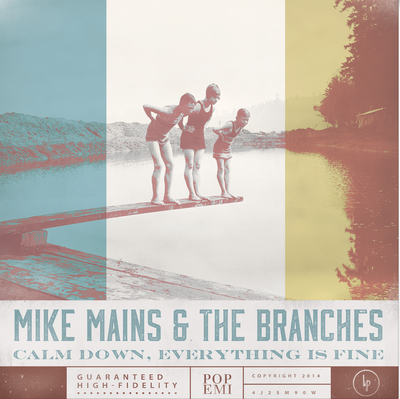 Mike Mains is an indie rock songwriter from Michigan who is kicking off his Spring tour in Pittsburgh tonight (Wednesday, 4/18) at The Funhouse at Mr. Smalls behind his sophomore release Calm Down, Everything is Fine. Joining him for support are locals Matthew Maraist and blog faves Ryan Hoffman and the Pioneers. I want to thank Mike for taking the time to participate in this edition of First/Last. Hanson – Middle of Nowhere. Third Eye Blind – Self-Titled. The National touring Trouble Will Find Me. Favorite thing about Pittsburg is the friendships we’ve made in that City. We’ve had so many fans open their homes to us and those relationships have grown into some great friendships. Pittsburgh people are loyal and tough, which are great traits! Thanks, Mike. I had to look up Mickey Avalon. Maybe it would have been better if Simon Rex was with him… maybe not?